How does a bank adapt to growing competition and shifting customer expectations without losing what has always been its greatest strength and brand differentiator: an old-school, high-touch approach? That was the challenge facing this $1 billion regional bank with 17 locations in the South. To adapt strategically, management needed a deeper, objective understanding of their customers’ evolving wants and needs. But they struggled to find a proven solution that would provide actionable, statistically valid data from all customer segments, employees, and prospects. Omni-channel customer data by a variety of demographics, including business segment, geography, products, etc. With this data, the team was able to analyze customer experience across multiple dimensions, which helped the bank scrutinize some long-held (and not always accurate) assumptions. Quantitative insights made the road ahead much clearer for this bank. Changes are easy to monitor, and improvements to ROI have reinforced the bank’s confidence in the results. The results were clear. The bank’s tech- savvy customers valued speed and self- sufficiency as much as friendliness. So the team dug into their Touchpoint Mapping dashboard and articulated a path to sustainable growth based on actual customer insights. 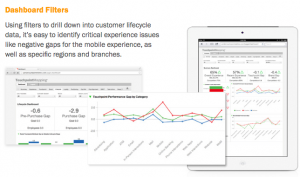 Mobile Experience: Customers wanted better mobile banking. Investment here would reduce high-cost branch banking and the competition’s big advantage. Design & Usability: Online banking services had subpar design and usability. More Oversight Needed: Empowering employees, part of the bank’s brand, led to inconsistent lending practices. Wallet Allocation: The number of financial institutions used by customers came as a big surprise to the bank. Awareness: Customers used national banks for services like wealth manage- ment, which this bank also provided. Geographic Differences: The data showed different customer expectations by neighborhood. Business Consulting: Despite a robust business-lending share, business consulting was in demand—and missing. Transactional Inefficiency: Processes needed streamlining to speed trans- action times. Right Time for Face Time: Daily customers want fast, efficient service, but big financial decisions like mortgages take a face-to-face experience. Continuously measure improvements against baseline data and validate changes by testing in multiple locations. By identifying experience and touchpoint gaps, the bank has a roadmap for scaling and delivering improved customer experience across customer segments. Immediate improvements include shaving one-third off the time of some of their more demanding transactions. Mobile and web improvements moved high-cost, high-touch transactions to digital channels, without disappointing customer expectations. The bank has also customized product offerings within different markets, boosting loyalty, advocacy, and revenue. Most importantly, management now sees the direct correlation between customer experience and profit.